Last night Jacob and I went out to play Pokémon Go. I will be honest. I’m not particularly interested in Pokémon. Never have been. Never fully understood the fascination with the cards, or what my kids did with them. Jacob downloaded Pokémon Go on his phone. Last night he asked me if I wanted to go play it with him. I’ve been complaining that I’m not getting enough exercise. There are a couple of problem people in my neighborhood that have kept me from wanting to go out by myself. Plus the awful, surface of the sun, heat. But last night my son volunteered to go outside to walk around with me and look for Pokémon’s. I jumped at the chance. I found a few. I’m not very good at catching them, but I had expert assistance. It was fun. Walking around the neighborhood. Talking to Jacob. Getting exercise. As we were heading home, after walking around for about 30 minutes and finding a couple of Pokémon, a young couple drove by and the passenger leaned out the windows and asked, “Are y’all playing Pokémon Go?” And when I replied we were, he said, “That’s awesome!” I beamed and wanted to say, “I’m that fun kinda Mom you’ve always heard about!” But instead we just waved. There was no picture on the steps in his new uniform, shoes, haircut, and backpack. There are, in fact, no new uniform, shoes, haircut, or backpack today. I didn’t even think about it until we were about half-way there. I made him take a selfie as we were driving down the street. It wasn’t very good, and he’s not here to discuss it with, so I won’t post it. He’s taking an OK History class. They go to different places around the state everyday for two weeks, keep a journal about it. Bing, Bang, Done! I don’t know how I let this slip up on me. My youngest child, is starting/has started high school. He will be the class of 2020. It feels like just yesterday that he was a baby. We’ve been preparing for this all summer. And I was good with that. Maybe it was that list thing. And the actually getting something done thing. And while I was driving him there early this morning, it dawned on me. This is his first day of high school. I am the Mother of a high schooler. Again. And for the last time. I have discovered the greatest app for my phone. 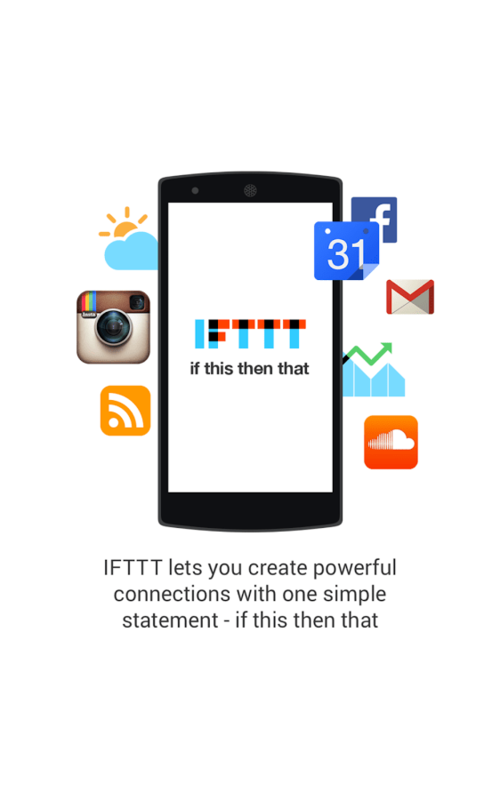 It is called IFTTT-that stands for If This Then That. The brilliance behind it is if This happens on my phone, then That happens. The This is called a Trigger and the That is called an Event. So, for instance, I have a Recipe on my phone, that when I take a picture on my phone IFTTT automatically uploads it to my Microsoft Cloud. Or I have another one where when I have an appointment, or a meeting, on my calendar, it automatically sets my phone to vibrate. Sometimes I wish everyone had this. Unfortunately, I have to remember to turn the sound back on, but some days I feel like I spend more time with my phone turned to silent than I do to having the sound on. It is available on the iTunes store for you Apple folks or the Google Play Store for all you Droid folks. I really does seem to work as designed. I’ve not found any bugs. And it’s free! Who could ask for more than that? I mean, I guess I knew in a general sense that soft lips were young looking and dry lips were…unattractive, but anti-aging chap stick? En-biggen the picture, the one on the right says “anti-aging” right there in the red dot. Usually, I buy the regular, old fashioned, chap stick. 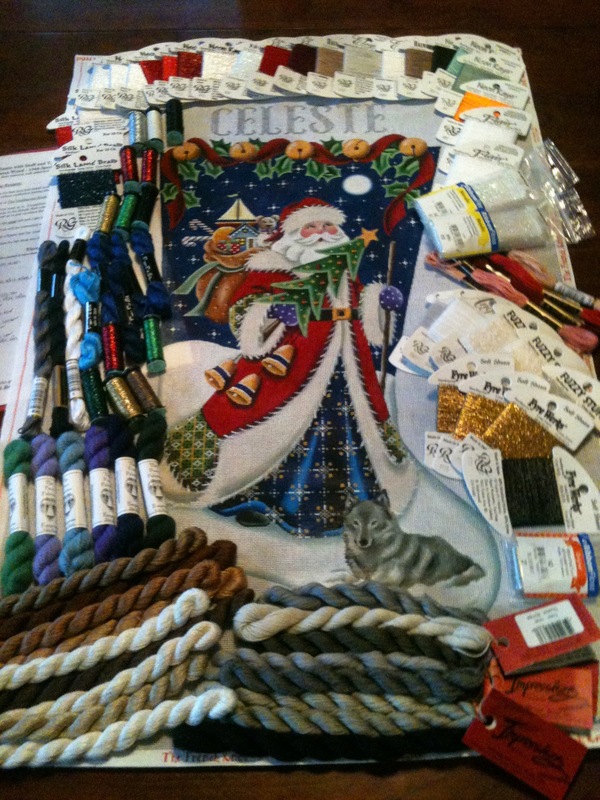 In the bulk packages of 3 or 6 or however many you can buy at one time. Because I always have to have a chap stick with me. But this Sunday while I was out, I had a coupon, and it was on sale, and I was there buying some hair products that were on sale too. So, I bought these two. The web page is calling them Duel-Ended Hydration Lock. One end is “moisturizing,” the other end is “renew” on one. The other is “night” and “day.” The “day” one has an SPF 12. I use lots and lots of chap stick. I’m not sure whether I am genetically predisposed to having dry lips or what, but I almost always have something on hand to put on my lips. 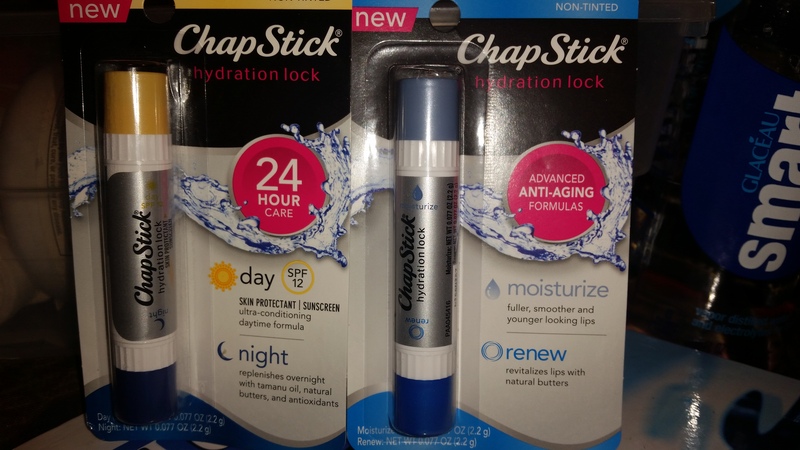 I’ve tried a lot of the lip moisturizing products but almost always come back to plain old chap stick. For a little while last year I was on a quest for a lip gloss that had moisturizing properties and that I didn’t have to reapply all the time. I didn’t really find that and gave up that quest. I didn’t like the tacky way it made my lips feel. None of them were really moisturizing. I felt like I needed to reapply them about every 15 minutes. It felt vain to be putting shiny stuff on my lips all the time. I’ve tried all four ends on the two Dual-Ended Hydration Lock. My general impression is they are pretty nice. They aren’t twice as big as a regular chap stick, so I’m assuming there isn’t twice as much product as you would get in a regular chap stick. But what is there seems nice. The “renew” side of the one seems a little gritty; noticeable but not irritating. The moisture side is very nice; smooth, moisturizing, not too greasy. The moisture side of the one stick and the night side of the other feel very similar to me. The day side feels very nice as well. None have a bad or bitter taste to them. I really appreciate that because some of those lip moisturizers taste nasty. I think at $3.49 each, they may be a little expensive to carry around in my pocket, purse or backpack. To sit on my bedside and be my night time go to lip moisturizer, maybe. I think next I’d like to try their other new product, the Hydration Lock. Disclosure: Chapstick did not pay me or provide me with anything to write this. In fact, I doubt Chapstick knows that I exsist. But. 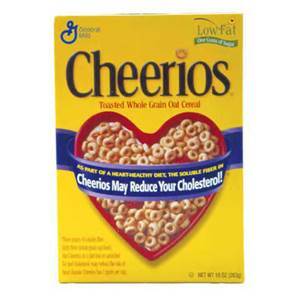 It requires a pretty big serving a day to reduce cholesterol and frankly, I can’t eat Cheerios without a ton of sugar on them, so it is, for me, very calorie dense. I began a quest to see if I could find a recipe to make oatmeal palatable. I’ve tried the non-cook oatmeal. 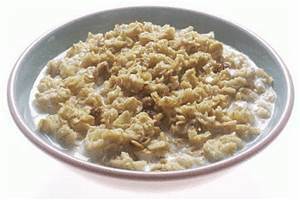 The idea is you soak rolled oatmeal, over-night in a liquid of your choice, milk, almond milk, soy milk, juice and/or yogurt and/or fruit and mix it together in the morning and you’d have a great, easy breakfast. Moi? Not so much. I didn’t like the consistency. It was still very sticky and gooey. Not at all pleasant. I tried mixing it with Advocare Meal Replacement Shakes I had left over from when I was running. I think I actually liked that the best. But alas, those Advocare Shakes are a little expensive. So, when I finished what I had, I didn’t buy more. I found this recipe for To-Go Baked Oatmeal on the Wholesome Dish I might try. Sort of a muffin made out of oats instead of flower. It looks like you’d have to eat three of these muffins in order to get a full 1/2 cup serving of oatmeal, so that too might be a little calorie dense. What have I been doing so far? Making smoothie sort of things. Yogurt, almond milk, 1/2 cup of old fashioned oats. Sometimes I add fruit or spinach or whatever I have around the house. I’ve been using almond milk because it is much lower in calories than 2% milk. I use Greek yogurt because it has more protein and fewer calories than regular yogurt. I’ve experimented with the best way to manage this. I have recently begun running the oats through the blender or the individual smoothie maker before mixing the yogurt and the liquid. This seems to grind the oats to an almost flour consistency. It makes the drink (a little) less gritty tasting. This is especially convenient if I need to take it with me. I can mix the yogurt and almond milk in a container, stick it in my lunch bag with an ice pack and put the oatmeal into a small container and mix them when I’m ready to drink it. I wouldn’t recommend mixing them beforehand because I think the oatmeal would absorb the liquid and turn into that gooey consistency I don’t like. I guess we’ll see how this goes. I really don’t like oatmeal, but I do know it’s good for me: Fiber! Cholesterol reducing! Making me feel full! I guess next time I give blood, we’ll see if it really helps lower cholesterol. Well this week we had to do it AGAIN. Only this time they only took two more. Poor kid, I don’t think any of his back teeth came out without assistance. This time we went to the dentist and she did it without putting him under instead of going the oral surgeon route. I’d seen the x-rays and I told him if he’d just let me, I could pop them out myself. Of course, he wouldn’t. I was right, she just popped them out with this screw driver looking tool but with the benefit of gas and numb gums. Luckily I was able to schedule it on a day when we were both off school, but he didn’t have any long-term effects and didn’t even require a Motrin. Now if we can ever get all those teeth to grow in, we’ll begin phase II of the great braces adventure. Man! I can’t believe it’s been almost two years since I’ve been here. I remember when writing here was an important part of my life. I became a Grandmother! 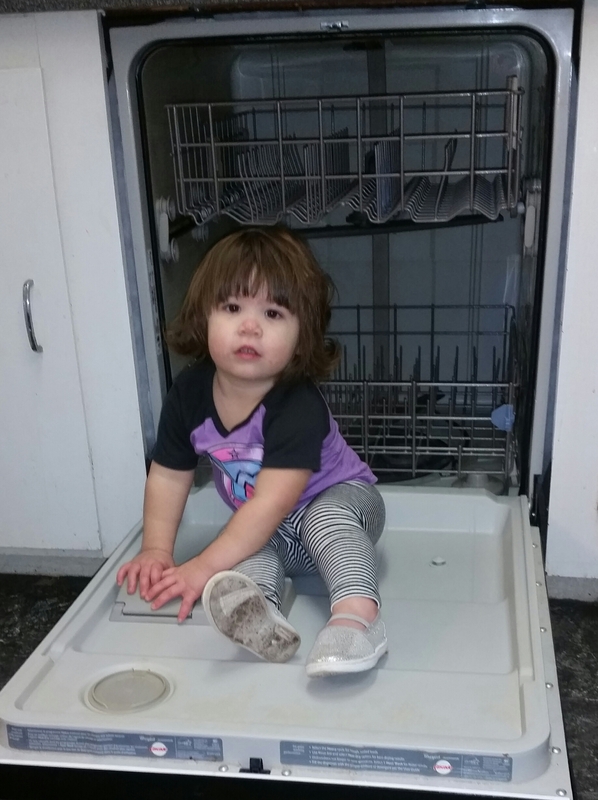 And yes I do have the most precious grandchild in the world. Run a 1/2 marathon. I know! Moi? Yes. I trained and did it in the Spring of 2012. It looks like I’ve written here since then, but didn’t write about the Marathon. I was probably too tired. It was good. I don’t remember my time. But my greatest fear, that I’d sit down on the curb at some point toward the end, cry, and call David to come pick me up didn’t occur. So it was a win! I looked and I don’t have ANY marathon pictures. I know it happened. I was there. 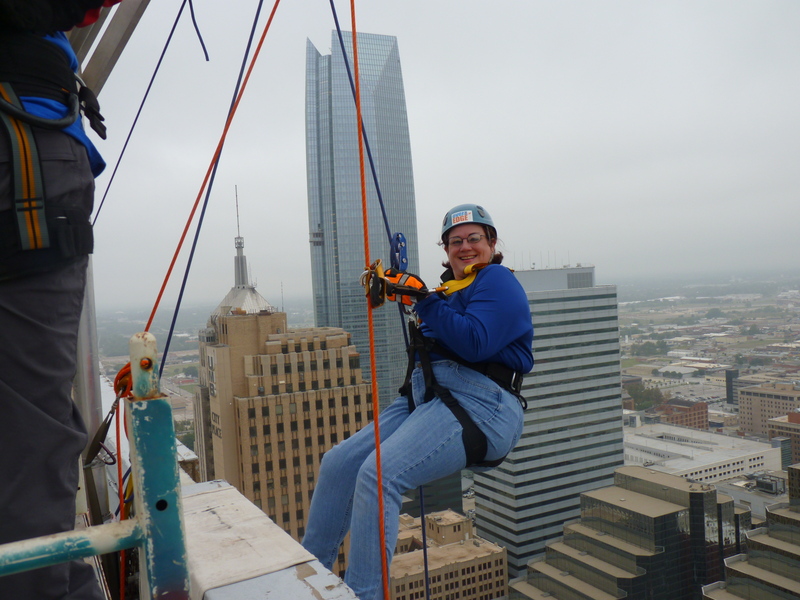 I rappelled off a 31 story building. It was awesome, though a little scary. I would highly recommend it to anyone who is thinking about doing it. I began full-time graduate school. Which has largely accounted for me not being here. It’s exciting and interesting. I’ve met a lot of awesome new people who I would probably never had an opportunity to meet before. I am scheduled to finish in December of 2015. The BoyChild is doing great. He is in the 7th Grade. He still likes me. I fear, however, we are entering those dreaded teenaged years. He can cop an attitude on a dime, and go from acting like he thinks I’m the greatest thing since sliced bread, to acting like he wonders what rock I just crawled out from under. I would like to write more. I enjoy it but I sometimes feel like I don’t have control over what I can do, and this is one of the first things to go when that happens. How come when the Orthodentist say, “we’re going to need to remove a few teeth” it suddenly turns in to EIGHT teeth? As my son pointed out to me a few is two, three at the most; NOT eight. He is an astute child but they are his eight teeth. If anyone wants me, I’ll be wimpering under my desk thinking about the pain of pullin ‘a few’ teeth.